Congratulations to Billie Burkhart! You've won the Philips Streamium Giveaway! Philips Streamium Network Music Player Giveaway! 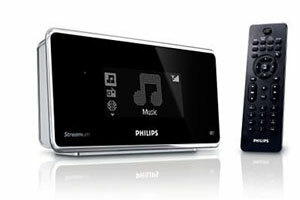 Enter now through January 12, 2010 to win a Philips Streamium NP1100 network music player ($179 MSRP)! By connecting to both your PC and audio system, the Philips Streamium network music player gives you wireless access to your PC music library, Internet radio and Rhapsody online music service. Thousands of free Internet Radio Stations, without having to turn on your PC. With UPnP connection, the Streamium network music player can access the music stored in your PC and stream it to a music system, so you can enjoy your favorite music in great sound quality. Instantly access millions of songs anytime through the Rhapsody® online music service (subscription required). Connect via ethernet or wirelessly with the built-in 802.11g wireless connection. Then, post a comment below indicating your interest in entering the giveaway. Please use the same email address you subscribed with whe commenting. Maximum of one entry per person. The giveaway will end at 11:59pm on January 12, 2010. I’d love to win! I’m an e-mail subscriber. I’m subscribed. Looks like a great network music player. My hubby would love this. He already likes to listen to his music from his iPhone while doing things around the house. I’m sure the music would sound better coming through this! We already subscribe to Rhapsody (which I use almost every day), so it would work out perfect. I’m a subscriber that couldn’t last a day without music. I would love to have something to start streaming all my tunes with. I’d love to win this. I subscribed the newsletter and filled out the profile. What a great prize, PICK ME!! I am a subscriber and would love to win!! I am an email subscriber. Thanks for another great giveaway. My son thinks it would be cool to have! Merry Christmas from one of your many subscribers! Please enter me in your contest….I would love to un-wrap one of these! I would love the gift of music! The Philips Streamium Network Music Player Giveaway is really great. I hope to win and get a chance to listen to some music. I’ve been looking at these and reading some reviews. I think it would be great to have and would love to win it! Finally someone got smart and developed this! I def could use this item as I am redesigning my kitchen with a NJ designer. I love my podcasts and audio books. This would really come in handy. Thanks for the chance to win. Please enter me. Thanks! Much success in 2010, I just found out about your website. A friend of mine has one and its cool. I would love to win this internet radio. Subscribed. I can never have enough music! Streaming would make my work day take note! I’m very interested in this great giveaway! Fantastic! Thanks for the giveaway. I subscribe and I’d love to win! Please enter me into this giveaway. Thanks for the chance. I’ve just found two cool internet radio stations in Australia that I’ve started listening to recently and the Philips Streamium NP1100 music system I think would work even better than my laptop to stay tuned in via a wireless connection in my home.